Sometimes you come across something you wish you had done, written or painted, drawn or said. I vividly remembered one time telling my friend an in depth story I had witness only to remember at the end it was in fact an episode of Eastenders. 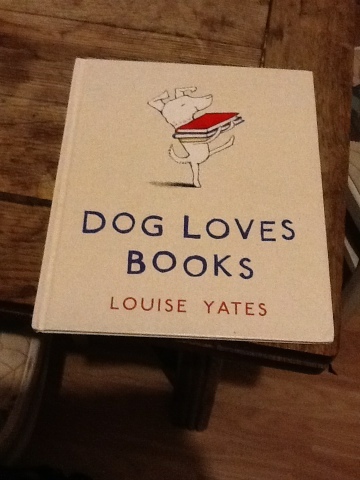 Today, I found this book by Louise Yates called 'Dog Loves Books' and the illustrations are so charming and withhold enormous insight into an obvious book lovers spirit. I love the way she gives the dog expressions so in-keeping with dog behaviour and yet really human. The disappointment and hope in his little eyes. Brilliantly told tale for people who love dogs or books or just touching imagination. Oh yes and kids will like it too. I wish I'd have made it!